It’s a given that LSU alumni love purple and live gold. 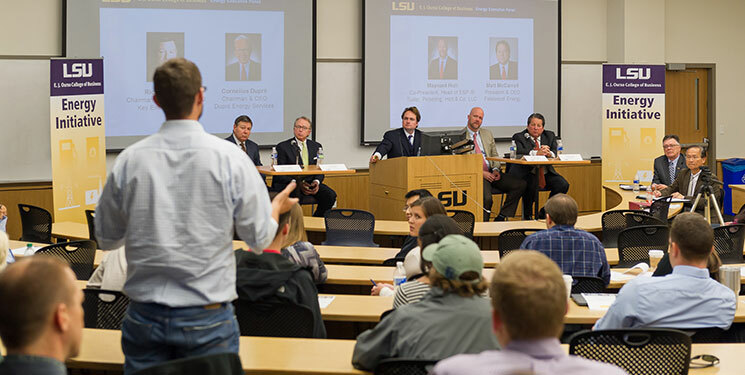 But a smaller subset of these alumni and friends feel a passion for the university that leads them to consistently pursue opportunities to strengthen academics at LSU. Members of a dean’s circle or dean’s advisory council contribute philanthropic and advisory support of a college, bridging financial investments and industry expertise with short- and long-term academic goals. While the nature and level of involvement of dean’s circle members varies among colleges, a constant is the ongoing, loyal support each member devotes to helping his associated college achieve success. In the College of Science, Dean’s Circle members contribute $1,000 or more annually in unrestricted gifts, or at least $250 annually for alumni who have graduated in the last 10 years. Since 2007, Dean’s Circle donors have provided the working capital needed to fund student organizations, educational travel expenses, faculty recruitment and recognition activities, and development initiatives to build alumni and community relations. Within the circle, a diverse group of leaders in industry and academia offers support and guidance to advance the college’s academics and research by serving on the Executive Committee. This advisory council provides external insight to the dean, enhances interaction and understanding between the college and businesses, enriches educational and research programs, and promotes a culture of philanthropy among alumni and students. Committee members represent each academic department in the college, as well as the Museum of Natural Science. Beyond its Dean’s Circle, the E. J. Ourso College of Business has a Dean’s Advisory Council, a select group of accomplished professionals who donate their time, talents, expertise and resources to support Dean Richard White in his efforts to enhance and grow the college. The “DAC” is currently working on four strategic initiatives that will bring the college to an even higher level of achievement. Through the initiatives, Dean White would like to strengthen corporate relationships to provide job opportunities for students, and better prepare students for careers within the energy industry. Through this energy initiative, students from across campus are scheduling classes to earn a minor in energy or an MBA specialization in energy. “Energy is one of the most important industries in the country, but also one of the least understood,” White explained, sharing that the courses will better prepare students for multiple industries.